The contest for president between Hillary Clinton and Donald Trump is marked by an educational divide that is far wider than in past elections. In Pew Research Center’s August survey, registered voters with a college degree or more education favor Clinton over Trump by 23 percentage points (52% Clinton vs. 29% Trump) in a four-way contest that included Libertarian Party candidate Gary Johnson (supported by 11% of voters with at least a college degree) and Green Party candidate Jill Stein (4%). By contrast, voters who do not have a college degree were more divided in their preferences: 41% backed Trump, 36% Clinton, 9% Johnson and 5% Stein. 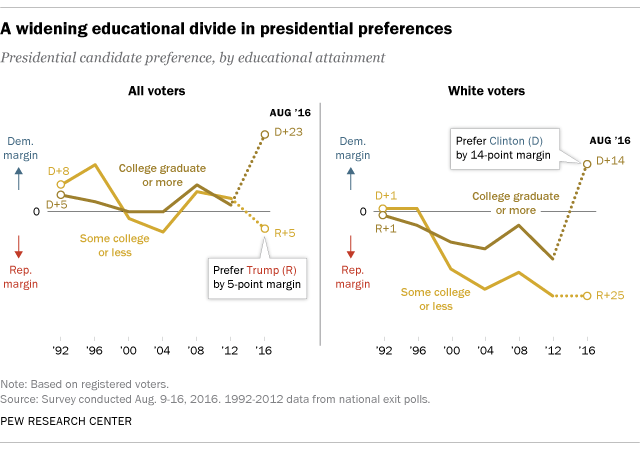 If the gap between Clinton and Trump holds in November, it will be the widest educational divide in any election in the last several decades. And the current gap is particularly pronounced among white voters. In most presidential elections going back to 1992, college graduates and those without college degrees have differed little in their vote choices: In 2012, Barack Obama narrowly won more votes than Mitt Romney among those with a college degree or more (50% to 48%), as well as those with less education (51% to 47%), according to exit polls. There have been similarly modest differences in the vote choices of college graduates and those with less education in other elections in the past few decades. The largest gap was in 1996, when voters without college degrees backed Bill Clinton over Bob Dole by a 14-point margin (51% vs. 37%), while voters with less education were more closely divided (47% Clinton vs. 44% Dole). Today, it is the more educated voters who are more likely to favor the Democratic candidate, and the gap between the groups is far wider than it was 20 years ago. Unlike the overall educational gap, an educational gap among white voters is not new – whites without a college degree have voted for GOP candidates by larger margins than their counterparts with more education in the last four presidential contests. But the gap this year appears to have grown wider. And if support for Clinton holds steady among white college graduates, 2016 will mark the first time in at least a quarter century that this group has supported a Democratic candidate for president. Among white voters in the current election, college graduates support Clinton over Trump by a 14-point margin (47% Clinton vs. 33% Trump), while those without college degrees back Trump over Clinton by an even larger 25-point margin (51% Trump vs. 26% Clinton), according to the Center’s survey conducted Aug. 9-16. Though a modest educational gap has been present among white voters since the 2000 election, over the past few decades, both whites with and without college degrees have consistently backed Republican candidates over Democrats. For example, according to the 2012 exit polls, Obama lost both the white college vote to Romney by 14 points (56% vs. 42%), and the white non-college vote by an even wider 26-point margin (62% vs. 36%). Recent Pew Research Center studies also have found increasing differences in party identification between those with more and less education. And there is a growing ideological divide between these groups, with highly educated adults holding increasingly liberal attitudes across a range of issues. The Center’s recent analysis of long-term trends in voter identification finds that Democrats have made gains among college graduates, while less educated voters are now more divided in their affiliation. In surveys conducted so far this year, the Democratic Party currently holds a 53% to 41% advantage in leaned party identification among voters with a college degree or more. In 1992, the GOP held a slight 49%-45% edge among college graduates. Over the same period, the Democratic Party has lost ground among less educated voters. 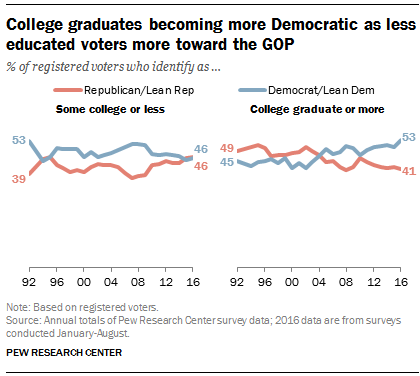 The balance of leaned party identification is now even among voters who do not have a college degree (46% each); as recently as 2008, Democrats had a 14-point advantage among this group (52%-38%). Beyond the shifts in vote preference and party identification, highly educated adults also increasingly have liberal attitudes and values, while there has been less change among those without a college degree. A recent Pew Research Center analysis found that in 2015, nearly half of college graduates (48%) held either consistently liberal (26%) or mostly liberal (21%) opinions about the role and performance of government, social issues, the environment and other topics. By comparison, just 31% of those with less education had consistently (8%) or mostly (22%) liberal views. Over the past two decades, there has been particularly sharp growth in the share of highly educated adults with consistently liberal attitudes – from 6% in 1994 to 16% in 2004 to 26% in 2015. 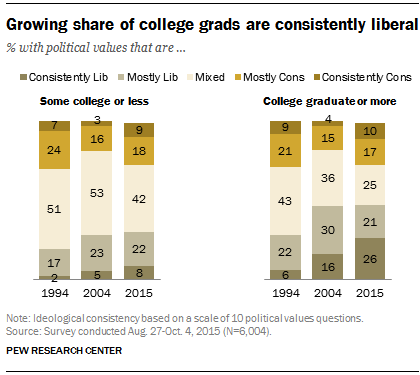 Among adults with no college degree, just 8% had consistently liberal attitudes in 2015, up from 2% in 1994.